UPTON — John Magnarelli, USDA’s top regional school lunch official, presented Blackstone Valley Regional Vocational Technical High School with a HealthierUS Award, one of the nation’s highest school nutrition awards, from the US Department of Agriculture. 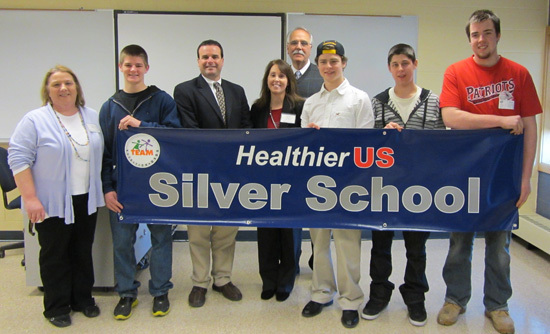 Magnarelli applauded the students, food service staff, and school officials for being the first high school in the state to earn the Silver award, and 1 out of just 10 high schools throughout the United States, in USDA’s HealthierUS School Challenge (HUSSC). Only about 2 percent of schools nationwide have achieved HealthierUS status. The Challenge is a key component of First Lady Michelle Obama’s “Let’s Move!” initiative to end childhood obesity within a generation. Schools participating in the Challenge voluntarily adopt USDA standards for food they serve at their schools, agree to provide nutrition education and provide opportunities for physical activity. Challenge winners are recognized with Gold of Distinction, Gold, Silver, or Bronze-level certification. Challenge certification also includes monetary incentives for schools – $2,000 for Gold Award of Distinction, $1,500 for Gold, $1,000 for Silver and $500 for Bronze. Improving child nutrition is a focal point of the Healthy, Hunger-Free Kids Act that recently passed Congress and was signed by President Obama on December 13, 2010. This legislation authorizes USDA’s child nutrition programs, including the National School Lunch Program, to make real reforms to the school lunch and breakfast programs by improving the critical nutrition and hunger safety net for millions of children. USDA encourages schools to use the HealthierUS School Challenge as a means of meeting the new reforms in school meal programs. Blackstone Valley Regional Vocational Technical High School serves the towns of Bellingham, Blackstone, Douglas, Grafton, Hopedale, Mendon, Milford, Millbury, Millville, Northbridge, Sutton, Upton and Uxbridge. Located in the heart of the Blackstone Valley, Blackstone Valley Tech creates a positive learning community that prepares students for personal and professional success in an internationally competitive society through a fusion of rigorous vocational, technical, and academic skills. The school�s website is www.valleytech.k12.ma.us.